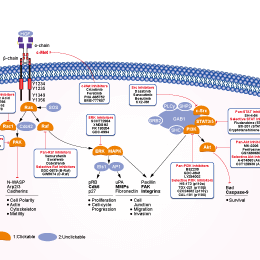 D. Effects of erlotinib and inhibitors of PI3K, MEK, MET or IGF-1R on phosphorylation of AKT and ERK in ER3 cells. Theranostics, 2016, 6(8):1232-43. Foretinib (GSK1363089) purchased from Selleck. c-MET/RON inhibitors restore sensitivity to lapatinib in SK-BR-3-LR cells. Cell growth was determined using the sulforhodamine B assay. The concentration used was 0.1 uM for crizotinib, MGCD-265, XL880, sunitinib, dasatinib, and TAE-684I. The phosphorylation of HER2, AKT and ERK1/2 was determined by Western blotting. Cancer Lett 2013 340(1), 43-50. Foretinib (GSK1363089) purchased from Selleck. Dr. Zhang of Tianjin Medical University. Foretinib (GSK1363089) purchased from Selleck. Oncotarget, 2018, 9(32):22769-22784. Foretinib (GSK1363089) purchased from Selleck. 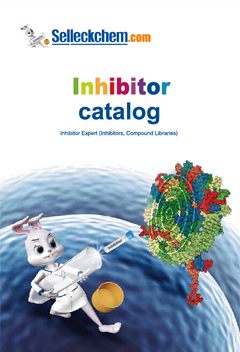 Kinase inhibition is investigated using one of three assay formats: [33P]phosphoryl transfer, luciferase-coupled chemiluminescence, or AlphaScreen tyrosine kinase technology. IC50s are calculated by nonlinear regression analysis using XLFit.33P -Phosphoryl Transfer Kinase Assay Reactions are performed in 384-well white, clear bottom, high-binding microtiter plates (Greiner, Monroe, NC). Plates are coated with 2 μg/well of protein or peptide substrate in a 50 μL volume of coating buffer contained 40 μg/mL substrate (poly(Glu, Tyr) 4:1, 22.5 mM Na2CO3, 27.5 mM NaHCO3, 50 mM NaCl and 3 mM NaN 3. Coated plates are washed once with 50 μL of assay buffer following overnight incubation at room temperature (RT). Test compounds and enzymes are combined with 33P-γ-ATP (3.3 μCi/nmol) in a total volume of 20 μL. The reaction mixture is incubated at RT for 2 hours and terminated by aspiration. The microtiter plates are subsequently washed 6 times with 0.05% Tween-PBS buffer (PBST). Scintillation fluid (50 μL/well) is added and incorporated 33P is measured by liquid scintillation spectrometry using a MicroBeta scintillation counter.Luciferase-Coupled Chemiluminescence Assay Reactions are conducted in 384-well white, medium binding microtiter plates (Greiner). In a first step enzyme and compound are combined and incubated for 60 minutes; reactions are initiated by addition of ATP and peptide substrate (poly(Glu, Tyr) 4:1) in a final voume of 20 μL, and incubated at RT for 2-4 hours. Following the kinase reaction, a 20 μL aliquot of Kinase Glo (Promega, Madison, WI) is added and luminescence signal is measured using a Victor plate reader. Total ATP consumption is limited to 50%. AlphaScreenTM Tyrosine Kinase Assay Donor beads coated with streptavidin and acceptor beads coated with PY100 anti-phosphotyrosine antibody are used. Biotinylated poly(Glu,Tyr) 4:1 is used as the substrate. Substrate phosphorylation is measured by addition of donor/acceptor beads by luminescence following donor-acceptor bead complex formation. Kinase and test compounds are combined and preincubated for 60 minutes, followed by addition of ATP, and biotinylated poly(Glu, Tyr) in a total volume of 20 μL in 384-well white, medium binding microtiter plates (Greiner). Reaction mixtures are incubated for 1 hour at room temperature. Reactions are quenched by addition of 10 μL of 15-30 μg/mL AlphaScreen bead suspension containing 75 mM Hepes, pH 7.4, 300 mM NaCl, 120 mM EDTA, 0.3% BSA and 0.03% Tween-20. After 2-16 hours incubation at room temperature plates are read using an AlphaQuest reader. B16F10, A549, and HT29 cells (1.2× 103 per well) are mixed with soft agar and seeded in a 96-well plate containing 10% FBS and EXEL-2880 over a base agar layer. For normoxic conditions, the plates are incubated (37°C) for 12 to 14 days in 21% oxygen, 5% CO2, and 74% nitrogen, whereas incubation (37 °C) under hypoxic conditions is done in a hypoxia chamber in 1% oxygen, 5% CO2, and 94% nitrogen. The number of colonies is evaluated under each condition following addition of 50% Alamar Blue and fluorescence detection. Qian F, et al. Cancer Res, 2009, 69(20), 8009-8016. Kataoka Y, et al. Invest New Drugs, 2011. Eder JP, et al. Clin Cancer Res, 2010, 16(13), 3507-3516. PF-04217903 : C-Met-selective, IC50=4.8 nM.